Fitting a wall sticker for the very first time can be a bit daunting. That's understandable, but take it from us, they really are simple to apply so there is no need to worry ! To make it even easier we have written a comprehensive step by step fitting guide with images to assist you. In addition our videos at the end will show you exactly how to apply wall stickers and decals in a in a very simple visual guide. #2. Remove the vinyl sticker/s from the cardboard tube and lay out on a flat surface, you will also find an envelope containing your application tool and detailed step by step fitting instructions. We advise reading the instructions in full before starting, just to get yourself familiar with the full application process. There are also 'how to' fitting videos at the bottom of this page, should you wish to watch the full visual guide to see how simple the full process is. Important tip: Always lay the the sticker face down before removing the backing paper and peel it away from the see through application tape rather than the other way round. This will ensure that the vinyl will hold to the application tape and is much less likely to stay stuck to the backing paper. Should any parts of the vinyl try to do this simply press them back against the sticky application paper and try again. 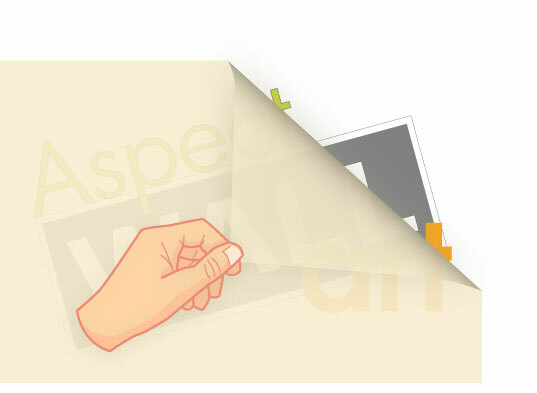 How to fit a wall sticker that requires being perfectly level - Before removing the backing paper, hold your sticker to the wall, temporarily using tabs of masking tape in each top corner. Use a tape measure and/or spirit level to level the design correctly (Be sure to level the vinyl parts wherever possible, as opposed to the outer transfer edge, as we don’t guarantee that it is perfectly levelled to the vinyl). Keep lifting and pressing down the masking tape tabs whilst levelling each side, until it is in the perfect position. Now attach two more pieces of tape each side of the sticker, horizontally level with the top edge, but not overlapping any of the sticker. (Alternatively use a pencil and lightly mark each side where the top edge of the sticker should be fitted, these will be your guides to follow when applying it to the wall). Take the sticker away from the wall, just leaving the tape guides or pencil marks. You are now ready to apply your wall sticker by following the instructions at the start of step 3. #4. Top Tip: Once fully applied to the wall leave the vinyl wall sticker for at least 10 minutes before removing the application tape covering the vinyl. This is simply to ensure that the adhesive has time to fully adhere to the chosen surface, making removal of the application tape even easier. #5. Carefully peel off the application tape layer to reveal your chosen vinyl wall art design in all its glory ! Still need convincing? Check out our 'Why Choose Us' information.